Week 5 was another opportunity for playmakers to make plays, and a group of familiar faces did just that. As the bye weeks engage, and the injuries continue to mount, the receiver landscape in the world of fantasy football has its resolve tested, but it's those reliable, familiar faces that we lean on when the adversity has us on the brink of placing our teams in fire sale mode. If you're like me, and teetering on the edge of pushing the red freak out button for whatever reason (injuries! ), relax, and trust your playmakers. As we rank our wide receivers ahead of week 6, keep in mind that an asterisk (*) next to a player's name denotes a possible injury concern for that player. 1. Odell Beckham Jr.* @ PHI- His status will need to be closely monitored as he pulled a hammy in the fourth quarter of his team's week 5 win, but ODB is our top man this week. The extra day off should benefit him as he looks to shine under the bright lights of primetime once again. 2. Julio Jones* @ NO- Also battling a hammy problem, and a short week doesn't help him, but assuming he's good to go, Julio is a top-3 play. He's facing a bad defense and plays for a team that just can't seem to do any wrong. Labored through most of week 5, but salvaged his day by pouncing on a loose ball in the end zone for a touchdown. 3. A.J. Green @ BUF- Tough matchup with Stephon Gilmore and Buffalo, but A.J. and the Bengals' confidence is sky-high after a thrilling victory over the Seahawks in week 5. He'll likely face some schematic issues from Rex Ryan and Buffalo's end, but a talent like Green can only be contained to a certain degree. 4. Randall Cobb vs. SD- The numbers haven't quite been there for Cobb, but the extra attention he's seen without Jordy Nelson and Davante Adams has had a part to play. That attention won't lessen against the Chargers in week 6, but Cobb should see plenty of balls coming his way. Aaron Rodgers looked -- dare we say -- somewhat human in week 5, so he and Green Bay will be looking to come out and spin it. 5. Calvin Johnson vs. CHI- Megatron comes off a couple of tough matchups against Seattle and Arizona and will look to get back on track at home against Chicago. Expect Matthew Stafford to go the extra mile in getting his big guy involved early and often. In two games against the Bears last year, Johnson totaled a 17/242/2 line. 6. 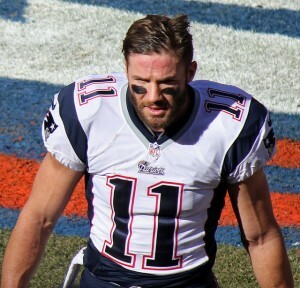 Julian Edelman @ IND- Don't expect Bill Belichick and the Pats to show any quarter to the deflate gate whistle blowers. Edelman could have a field day with plenty of targets likely to come his way, and some extra wiggle room if Indy chooses to scheme extra attention Rob Gronkowski's way. 7. Demaryius Thomas @ CLE- Outperformed by teammate Emmanuel Sanders in week 5, and Peyton Manning's ability to deliver the ball seems to be waning week-by-week, but Demaryius is still a top-10 play. He is electric after the catch, and the Broncos' passing game should be more simplistic moving forward in an attempt to relieve some of the pressure on Manning while simultaneously finding ways to get the ball to Thomas and Sanders in space. 8. DeAndre Hopkins @ JAX- Nuk has garnered stud status on the strength of some big performances thus far in 2015. Don't expect him to slow down against Jacksonville as Houston looks to rebound from a tough week 5 loss. 9. Keenan Allen @ GB- Allen has somewhat of a hot/cold element to his name, but should be locked in as a top-15 play in a game that figures to produce plenty of points. If Green Bay strikes early and achieves some separation, the Chargers will need to throw the ball, and Allen will be leading the target line on the perimeter. 10. Emmanuel Sanders @ CLE- Like Demaryius Thomas, Sanders' success may depend on how much juice Peyton Manning's arm can generate on any given gameday. He was able to make do to the tune of a 9/111 line, with 12 targets thrown his way. The 12 targets are the key, and while the Broncos' downfield passing game is hampered by Manning's lack of zip on the ball, both Sanders and Thomas remain WR1 plays on the strength of their after-catch abilities. Julian Edelman is a top-10 play in week 6, with even greater upside in PPR formats. Brandon Coleman vs. ATL- With Marques Colston (shoulder) unlikely to play, Coleman's role will expand alongside Willie Snead. The Saints desperately need another playmaker to emerge behind Brandin Cooks. Snead has done his part, and now Coleman has a chance to make his presence felt. Dwayne Harris @ PHI- If Odell Beckham Jr. and/or Rueben Randle (both hamstring) can not go, Harris will be ticketed for a much bigger role in the Giants' passing attack. Torrey Smith vs. BAL- Revenge games are usually more exciting when the player goes back to where he came from, but with the Niners' offense finally showing signs of life, Smith could be in for a nice day at home in the bay area as Baltimore comes calling. Roddy White- Much like the aforementioned Torrey Smith, White isn't a name usually associated with sleeper status, but he has virtually disappeared in the Falcons' gameplans this year. That could change in week 6, with Julio Jones limited by a hamstring problem. White has a history of turning it on against the Saints, or at least trying to. Devin Funchess @ SEA- Coming off of a bye week, this may be a chance for the rookie to turn heads, albeit in the toughest of settings. Keith Mumphery @ JAX- If Cecil Shorts III and/or Nate Washington miss out, Mumphery could see anywhere from 7-10 targets.